Raise vehicle only a few centimeters (one inch) from the floor when doing operations on a freewheel or frame-contact lift. Tips for mounting a tire? Use the manufacturer’s recommended rim size for the tire. Check tire pressure to prevent over-inflation or under-inflation. Guide the air hose back by hand on air pumps that have an automatic or weighted hose rewind. Do not let the hose fly back because the metal chuck or gauge may whip causing injury or damage. If the hose does not retract automatically, recoil and return the hose to the hanger. Do not hammer on rims or components with a steel hammer to correct seating of flanges and to lock ring. Use rubber, lead, plastic or brass-faced mallets and make sure the tire is uninsulated. It was in 1845 that the pneumatic or air-filled tire – which works by air within the tire absorbing the shocks of the road – was invented and patented by RW Thomson. His design used a number of thin inflated tubes inside a leather cover (see illustrated). This meant that it would take more than one puncture before the tire deflated. However, despite this new breakthrough in tires, the old solid rubber variety was still favoured by the public, leaving the pneumatic tire out in the wilderness. It wasn’t until 1888 that John Boyd Dunlop, unbeknownst to him, reinvented the pneumatic tire whilst trying to improve his son’s bike. Dunlop’s tire, like Thomson’s, didn’t seem to sell at first – until a bike race in Belfast was won by a rider using his tires. With that victory, people began to take notice of the pneumatic tire. shown, the tire is rated A for wet conditions and C for fuel efficiency, and 72 decibels which is normal or average noise performance. The above rules should not be followed if your tires are ‘directional tires’. The tread pattern on this variety tire is designed specifically to work in a certain way in relation to its position on the vehicle – switching sides would be dangerous. Worn ti res significantly impede the performance of your car – low tread depths reduce the effectiveness of braking, steering, and acceleration, all of which are vital in staying safe. What are a few minutes put aside now to check your tires, when you compare it to your own safety and that of your family? The aspect height of a tire is shown in the tire size as a percentage of the width – the aspect ratio. When changing tire size, the tires should not have more than a 1% difference in diameter – less than 0.5% would be ideal. 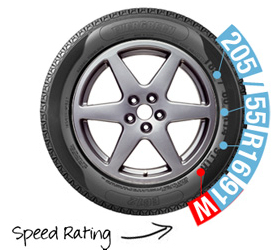 The speed rating of a tire is displayed on the sidewall. Like in the image, you will find it at the end of the tire’s size. It is always represented by a letter – in the following example the tire speed rating is “W”. 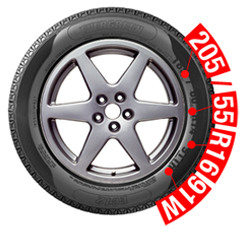 For example, the “W” rating seen in the image, tells us that this tire can reach speeds of up to 168mph. The diagram below shows the Dunlop DSST run flat system. These tires can be placed on any rim – the sidewall is reinforced allowing the tire to support the vehicle’s weight. The tire is constructed with new rubber compounds that prevent tire destruction with excessive flexing. Run Flat Tires allow a vehicle with complete loss of tire pressure to handle effectively. Braking, acceleration, and steering behavior remain unchanged. Mobility is also maintained even after a puncture, but you must refer to each individual tire’s guidelines from the Manufacturer. Check your tire pressures on a regular basis. Incorrectly inflated tires affect vehicle handling, whilst under inflated tire increase fuel consumption. Make sure that your spare tire is also correctly inflated – make sure your tires have plenty of tread depth. In wet and cold conditions tire performance is critical once the tread depth falls below 3mm. The legal tread depth is not necessarily an indication of safety! Keep a tool kit in your car – a jack and wheel removal tools are essential. Avoid traveling in severe weather conditions unless it’s an emergency.